Notified by an alert neighborhood network member just before 6PM on Thursday, September 15, 2016 of the accident at 24th and Castro. I do not know the accident time but most likely about 5:30PMish. SFO 475, placard 06-5092, a double deck bus, was in the middle of the intersection with the vehicle to the right. The large Commuter Bus was negotiating a right turn from westbound 24th to uphill northbound Castro. WeDriveU 2613, 05-5055 was parked on northbound Castro immediately south of 24th Street in the middle of the street. I can only assume this bus attempted to circumvent the 24th Street backup and operated on residential streets to get into this position. When I arrived just after 6PM there was no traffic control at the intersection. Traffic eastbound 24th was flowing but autos stuck between the Corporate Buses were attempting to drive around them. Only observed one Police Sargent about 6:15PM when the flat bed tow truck arrived. He then departed. The wide turning buses at this intersection cause “intersection stalemate”. Bus turning in either direction cause autos to pull to the right, back up, or freeze in place unexpectedly facing an oncoming bus in their lane. The new crosswalks installed last year are severely damaged by the buses turning up the steep Castro Street Hill. With over 30 buses an hour, the traffic flow is negatively impacted on both streets. Muni line 24 was delayed by three buses or at least half an hour. About 6:45PM I called 311 and the outbound (return southbound) line 24 bus was five minutes 25 minutes and 29 minutes. So I opted for a 48 bus for a short grocery shopping trip. I assume this incident has been documented, as I did not observe the police making a report. This may be considered a minor incident, but the vehicle was towed and created considerable disruption to Muni, with the neighborhood sharing in the daily pain of the very large Commuter Buses. Two photos show the subject bus and the other photo shows the 24th Street backup. If operated by a single agency, the private tech shuttles would be the seventh-largest transportation provider in the Bay Area. Source: Metropolitan Transportation Commission. On any given day, more than 800 “tech buses” negotiate narrow city streets and congested freeways to cart employees to offices throughout the Bay Area, according to a first-of-its-kind survey released Wednesday by a regional transportation planning agency. There are so many of the large, privately owned shuttles operating in the Bay Area that if they all fell under a single agency, they would be the seventh-largest transportation provider in the region in terms of ridership, according to the Metropolitan Transportation Commission, which released the study in conjunction with the Bay Area Council, a business-sponsored advocacy organization. All told, the 35 shuttle services included in the survey collectively carried some 34,000 passengers a day, or more than 9.6 million people in 2014, the last year for which data was available. It’s the first study to look comprehensively at the growing practice which ignited protests in San Francisco and in the East Bay over the past few years. Demonstrators have argued the buses are a symbol of gentrification and the employees who ride them to high-paid jobs in the South Bay are responsible for hastening the widening inequities in housing and pay in cities such as San Francisco and Oakland. While organizations like the Anti-Eviction Mapping Project have detailed the increase in evictions in areas adjacent to tech bus stops in San Francisco, Adrian Covert, the Bay Area Council’s policy director, said the rise in private shuttles is a response to the housing shortage, not its cause. At the heart of the issue, Covert said, is the both the region’s booming economic success and its failure to build enough housing in areas where new jobs are being added. The tide of tech and real-estate money flowing into the June 7th San Francisco election is now at more than $1 million, a stunning sum that’s paying in part for an all-out effort to keep the supporters of Airbnb and the developers in control of the city. This is more than a record; it’s an ocean of big money the likes of which I have never seen in this kind of election. Remember, the DCCC is not just a low-profile group that runs the local party. It has the ability to endorse candidates for local office — and in November, when thousands of voters who don’t pay that much attention to local politics but want to defeat Trump, go to the polls, that endorsement will be a major factor. Here’s how politics can be cynical and deceptive—with legislative gobbledygook and legalistic language that diverts funds from their supposed purpose of fixing Muni transit. Department of Elections Ballot: Endorse No on Prop J & K.
And it’s not too late to reconsider any previous endorsement of Prop J & K.
With a growing 5% of the U.S. population, Asian-American voters are a political force—due to strategic demographic distribution. In close elections, Asian-American voters are a reliable Democratic swing vote. 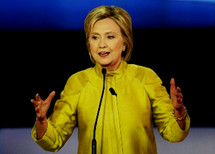 When the Wisconsin primary debate fell on the week of the Chinese and Lunar New Year, it wasn’t lost on Asian voters that Hillary Clinton wore an Asian-styled yellow jacket. A few weeks later, she was the only candidate to attend the annual dinner of the Asian-American Institute for Congressional Studies, at which President Obama has also spoken. In urban cores like San Francisco, elected Asian officials reflect a significant Asian constituency, especially with district elections. Yet, over time, these unique Asian-American identities and their historical landmarks may disappear—as have too many already. Hopefully, more political influence will translate into preservation of Asian-American culture—to cultivate the American melting pot. An urgent action is to stop the homogenization and gentrification of Chinatowns. Although Trump probably did not intend to offend, this interaction likely reminded Choe and other Asian American voters that being Asian often translates to being perceived by fellow Americans as a foreigner. In the 2012 presidential election, Barack Obama won 73 percent of the Asian American vote. That exceeded his support among traditional Democratic Party constituencies like Hispanics (71 percent) and women (55 percent). Asian Americans and Pacific Islanders, or AAPIs, are the fastest-growing racial group in the United States, increasing at four times the rate of the overall U.S. population. While this population is projected to double in size from 17 million people in 2014 to more than 40 million people by 2060, its voting power has already nearly doubled in the past decade. SFMTA spends 2.4 million for 2 minutes. For the past five months crews have been busy remaking 23 blocks of Mission Street to make it more bus friendly, putting transit only lanes, taking out parking and rerouting traffic. The price tag on the project? $2.4 million. Muni says the transformation will save commuters about two minutes. Local business owners say the money, along with the time saved, is just not worth it. “We support better service for Muni riders, but this is basically hurting the businesses and the economic vitality of this community,” says Roberto Hernandez of the Mission Merchants Association. The trouble is faster buses also means fewer cars coming in to shop.